The 2" Cordless Vinyl Mini Blinds feature a reinforced steel headrail combined with premium room darkening and warp resistant PVC slats. 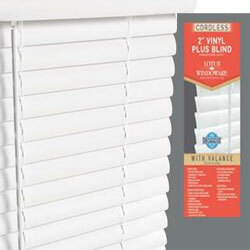 Designed for durability, these Cordless 2" Vinyl Mini Blinds withstand heavy duty abuse without compromising design. These 2 inch vinyl blinds are the perfect choice for the budget conscious homeowner or builder who wants an attractive, designer look at an affordable price. The 2 inch pvc slats on these vinyl blinds have a crowned shape that looks the same as the slats on a mini blind and also are tilted by an included wand. To complete the look, a 2" valance is included that installs over the mounting hardware and headrail. The bottom rail is made from a sturdy extruded hollow PVC that is 2" wide by 5/8 of an inch in height. Available individually or in case quantities, these in stock boxed and ready to ship vinyl blinds offer great pricing and easy ordering. For help or questions with any of our products, please email or call our knowledgeable customer service team. All widths are 1/2" less than stated size to allow for inside mounting.